When the 8-year-old girl climbed into the chair, hygienist Williams Rodriguez wasn’t prepared for what he was about to see. “Her 6-year molars were completely riddled with cavities, like a bomb went off,” he says. The girl’s mother thought her young daughter’s teeth were all baby teeth, destined to fall out eventually. “I had to tell her, ‘No, those were supposed to be there forever. If your kids lose those, that’s a big problem,’ ” Rodriguez says. Rodriguez says he might well expect to see this kind of extensive decay in his native Dominican Republic. He was stunned to find it in America. Children with rotted-out first molars, toddlers with tiny sepia-tinged incisors or teen-agers with plaque so extreme it’s cemented along the gum line are not uncommon at St. Apollonia Dental Clinic in Presque Isle, Maine, where Rodriguez is the only hygienist. Just 12 miles from the U.S.–Canadian border, Presque Isle is about as far east and as far north as you can get and still be in the United States. The downtown of rural Aroostook County’s largest city is little more than an intersection surrounded by rolling potato fields that are blanketed by the plants’ white flowers in midsummer. Like many of the country’s rural regions, Maine doesn’t have enough dentists—the state estimates there are five for every 10,000 residents. The farther afield you get from cities such as Portland or Bangor, the more geography turns a trip to the dentist into an expedition instead of a simple drive. Maine, which has the largest percentage of rural residents of any state in the country, could be the poster child for the access-to-care issues that confront patients who don’t live near urban areas. Presque Isle got lucky. It has a tooth fairy in Norma Desjardins, D92, who has made it her mission to provide dental care to the Mainers who need it most. 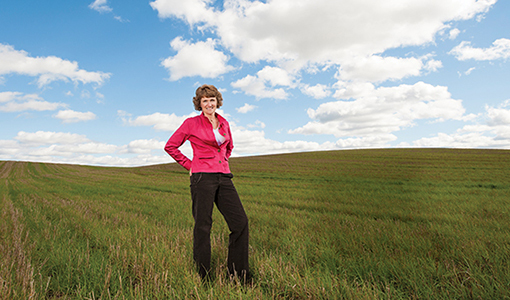 Born in rural Van Buren, Maine, where her brothers still run the family potato farm, Desjardins has practiced general dentistry in the region for 20 years. 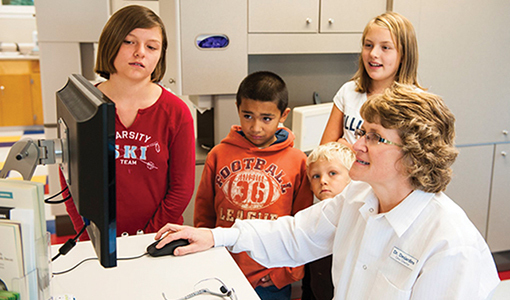 With her own children grown, she opened St. Apollonia (named for the patron saint of dentistry), a low-cost pediatric dental clinic, in March 2012, to serve Presque Isle, which has just under 10,000 residents, and neighboring towns. So great was the need that about 900 kids sought care in the new clinic in just the last six months of 2012, Desjardins figures. “It’s the old cliché, but I thought this could be my way to give back,” she says. “I feel like this is my mission trip, right in my own neighborhood.” Since the clinic opened in a former ob/gyn clinic just down the street from Aroostook Medical Center, so many kids have come through the doors—toddlers with cavities in every tooth, high schoolers who’ve never been to a dentist—that the two-chair clinic is already operating at capacity. Desjardins estimates that the majority of St. Apollonia’s patients, about 600 of them, are younger than 10. Because the patient case-load is skewed toward the little kids, the staff (a full-time dentist, the hygienist and a dental assistant) focuses on education and prevention. “If we could really teach them the preventive philosophy early, there wouldn’t be as much work to do,” she says. It’s not just the toddlers who suffer from poor oral health. Desjardins says the teen-agers’ situations are especially heartbreaking. Some teens make their own appointments and show up alone—clearly on their own already. Some have missing or misaligned teeth that she knows must make them self-conscious in social situations. Some have reached high school without ever seeing a dentist, including one 17-year-old boy who had the hardened layers of tartar across and between all his teeth known as a bridge of calculus, which occurs when teeth are not professionally cleaned. “We have to educate [patients] about more than just brushing and flossing. We have to explain to them [that calculus hardened like cement] is not the way your teeth are supposed to feel,” she says. St. Apollonia is not the first clinic Desjardins has started from the ground up. 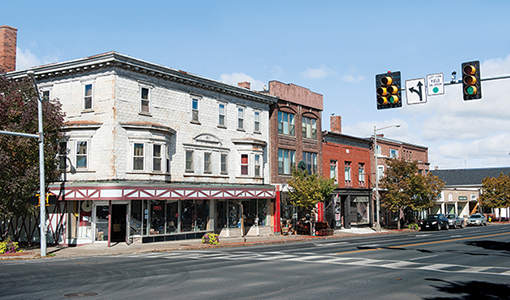 Right after graduating from Tufts, she returned to her hometown of Van Buren and, after applying to seven banks, secured a loan to buy equipment and launch her own practice. The only dentist in town, Desjardins found herself working six days a week, sometimes seven. Seeking a better work-life balance, she decided to join Academy Dental in Presque Isle, about 45 minutes south. Today, on top of her administrative and supervisory roles at St. Apollonia, Desjardins maintains her practice at Academy Dental. Just up the street from St. Apollonia, Academy Dental is the pediatric clinic’s “big sister,” says Desjardins, who salvaged Rodriguez’s hygienist’s chair from the basement of the private practice. Together, she and her partners at Academy take care of more than 7,000 smiles. Her husband, Paul, is Academy’s practice manager. Since Desjardins left Van Buren 16 years ago, the town—home to fewer than 3,000 people—hasn’t had its own dentist. Maine has fewer dentists per capita than most other states, according to a 2012 study commissioned by the state. With just five dentists for every 10,000 people, it’s lower than the average dentist-to-patient ratio in the United States (six dentists for every 10,000 people in 2007) and the lowest of the six New England states. As is the case in the rest of the country, dentists in Maine are clustered in the more populated regions, meaning that remote areas, such as Aroostook County, are dental deserts. While nearly two-thirds of Maine residents live in rural areas, according to the 2010 U.S. Census, just 13.5 percent of Maine’s dentists practice in those regions. That leaves more than 200,000 Mainers in federally designated “dental health professional shortage areas,” defined as regions with fewer than one dentist for every 5,000 residents. 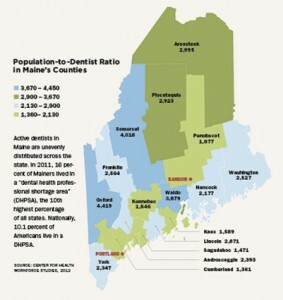 Larger than Rhode Island and Connecticut combined, Aroostook County has 72,000 residents and just 23 practicing dentists, according to the Maine Department of Health and Human Services. Before Desjardins opened her clinic, many Presque Isle residents drove three to four hours to see a pediatric dentist in Bangor or Augusta. Desjardins’ teams, both at St. Apollonia and Academy, use technology to make obtaining dental care as convenient as possible. When a toddler bumped into a coffee table and knocked a baby tooth out of place, staff from Academy emailed Jonathan Shenkin, a pediatric specialist in Augusta, a photo of the injury. Within minutes, Shenkin was able to advise them about how to proceed. “We did a little tele-dentistry,” says Desjardins. “It was great to be able to get his expertise that way.” While this happened at the private practice, Desjardins says she could easily see a similar scenario unfolding at St. Apollonia. Convenience is not the only reason Kathy brings her children to St. Apollonia, though. Each of them has a disability. Christopher is autistic and can be unpredictable at times. Other clinics, ill-equipped to manage his behavior, have turned him away. St. Apollonia “never hesitated to take him,” Kathy says. 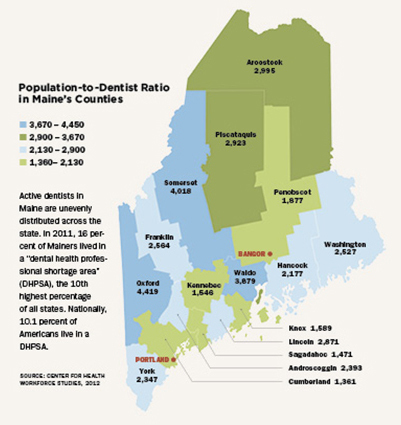 Active dentists in Maine are unevenly distributed across the state. In 2011, 16 percent of Mainers lived in a “dental health professional shortage area”. For some residents, even living next door to a dental clinic wouldn’t guarantee access to care. Beyond the scarcity of providers, many Mainers can’t afford to pay out of pocket, and few clinics accept public insurance. Maine’s rural residents tend to be older, sicker, poorer and less well educated than their urban counterparts. That demographic creates a perfect storm: residents of the state’s sparsely populated counties are more likely to have poor oral health and less likely to have dental insurance. The situation only worsened with the economic downturn. Even though a new report commissioned by the state of Maine found that a greater percentage of the total population had dental coverage in 2010 than in 2006, fewer had it through a private insurer. That means MaineCare picked up the tab for more and more patients, covering about 20 percent of the state’s rural residents. Between 2006 and 2010, the public insurer paid out an average of $31 million annually for dental care, an amount that represents less than 2 percent of the public insurer’s total spending. (Eligibility requirements vary by age, circumstances and size of family; for example, a family of four is eligible for free dental and medical coverage if its monthly income is less than $2,882. But even among the 110,000 children enrolled in the program, more than 53,000, just under half, went without dental care in 2010, according to the Maine Department of Health and Human Services. That likely has to do with MaineCare’s low dental reimbursement rates, which rank 38th in the country. Desjardins estimates the public insurance pays about half of what she’d normally charge for many dental procedures; for some dentists, the reimbursement rate is as low as 25 percent. Small wonder then that fewer than half of the state’s dentists accept MaineCare, and two-thirds of general dentists who do so limit the number of publicly insured patients they treat. That’s part of the reason Maine ranks 34th among the 50 states and the District of Columbia in the number of residents who have seen a dentist in the last year. While nearly two-thirds of Maine residents live in rural areas, just 13.5 percent of the state’s dentists practice in those regions. It was in 2009 that Desjardins first thought about opening a clinic to serve children with no place else to go. She had been asked to serve on a health services advisory board of the Aroostook County Action Program, an umbrella organization that helps connect low- and moderate-income families with such services as health care, job training and home repair assistance. Desjardins attended one meeting that focused on the difficulty of finding dental providers for local children enrolled in Head Start, the federal program that promotes school-readiness among toddlers from low-income families. Federal law requires all Head Start children to have a dental exam within 90 days of enrolling in the program. With the shortage of dentists in Maine, that can be tough. Desjardins was never one to shy away from hard work—she was among the top students in her dental class, even though she gave birth to her two children, Emily, now 24, and Gerard, 22, while she was in school. She began laying the groundwork for the low-cost clinic, writing grants for funding and making presentations to local groups, including the Rotary Club, the Kiwanis and the Knights of Columbus, in search of donations. Her big idea came along at the right time. Years of doing lengthy dental procedures had begun to take a toll on her health. The pain she had been experiencing in her neck, shoulders and arms began to worsen and affect her legs. Eventually, she was diagnosed with fibromyalgia, a nervous system disorder that can result in soft-tissue pain well as fatigue. “I went from somebody who had endless energy to someone who couldn’t walk from the bedroom to the kitchen without feeling like I needed a nap,” she says. She began devoting one day a week to getting the low-cost clinic up and running. After teaching herself to write grant applications to private foundations in Maine, she secured $65,000. She created a PowerPoint presentation, which she used with groups such as the VFW and the American Legion. The clinic became the Presque Isle Rotary Club’s special project, which helped raise another $38,000. “They presented us the check, and that’s how that first operatory became feasible,” she says. Once St. Apollonia had an operatory, Desjardins, needed to hire a dentist, and one who embraced community service in a big way. A native of upstate New York, Keely O’Connell, a 2012 graduate of Creighton University School of Dentistry in Nebraska, answered the call. O’Connell moved to Presque Isle eager to take on lots of responsibility early in her career. “It has been wonderful to have her as our inaugural dentist,” says Desjardins. “This year has gone by so fast. I have to admit every day presents new challenges,” says O’Connell. Amid all the new beginnings for Desjar-dins in 2012, there were endings, too. Between Thanksgiving and Christmas, her mother-in-law, Lorraine, and her father, Normand LaJoie, passed away. Now, more than ever, she sees the clinic as a tribute to the values her parents and her husband’s parents instilled in their children. “There are so many stories—so many things us kids don’t know—about our parents helping other families,” says Desjardins. “Now that my dad’s gone, I feel even more of a sense of responsibility to honor him and my mom by continuing this work. During their third or fourth year of school, all Tufts dental students embark on a required five-week Community Service Learning Externship at one of more than 30 sites nationwide. These off-campus training periods are designed to give students real-world appreciation for access-to-care issues as they hone their clinical skills. Cynthia Yered, D90, associate clinical professor of public health and community service, expects about a dozen members of the class of 2014 to be assigned to one of four such sites in Maine. 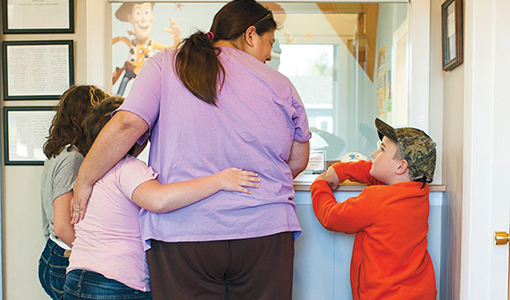 Katahdin Valley Health Center in Millinocket is the northernmost clinic and is still more than 100 miles south of Presque Isle, where Norma Desjardins, D92, operates her low-cost pediatrics clinic. As soon as she has another operatory, Desjardins hopes St. Apollonia Dental will be able to host Tufts externs. The other Maine extern sites are Caring Hands Maine, in Ellsworth; Penobscot Community Health Care Center in Bangor and Community Dental with five locations in southern Maine. Jacqueline Mitchell, a senior health sciences writer in Tufts’ Office of Publications, can be reached at jacqueline.mitchell@tufts.edu.